I don’t think there’s technically the best way to make coffee. It’s all relative. Nevertheless, if you ask me who’s the king of coffee making, the answer will be French Press indeed. As I’ve said earlier, I’m a big fan of the aroma of the coffee. Some days, I think I can live with an average coffee cup if it has a great aroma. This is exactly where French press coffees come in. Also known as a coffee press, press pot and coffee plunger, French press coffee makers are great when you’d like aroma over anything else. That having said, don’t expect to be the best barista by choosing one random product from the store. As it happens, you should know a lot of things before choosing the perfect French press for your home or office. What a coincidence, right? We have found some of the best French press that you can buy today and enjoy the aromatic coffee. Are you looking for an affordable yet effective French press coffee maker? KONA French Press Coffee Maker seems to fit both those qualities. Despite the lower price tag, you can brew one of the best cups of caffeine. We really liked the stainless-steel filtering system inside this beauty. There is no way you are losing the aroma or flavour of your coffee. Considering the build, it’s clear that KONA French Press Coffee Maker would last for a few years. Because it is all stainless steel, you don’t have to worry about leakages or durability issues either. One thing to be noted here is that it does not have an insulated carafe. You can basically solve this problem by drinking the brewed coffee within a few minutes. If you ask me, KONA French Press Coffee Maker is the perfect choice for everyone. You can brew an awesome cup of joe without worrying about aroma loss. We’re talking about the 12oz version of Bodum Chambord French Press Coffee Maker. 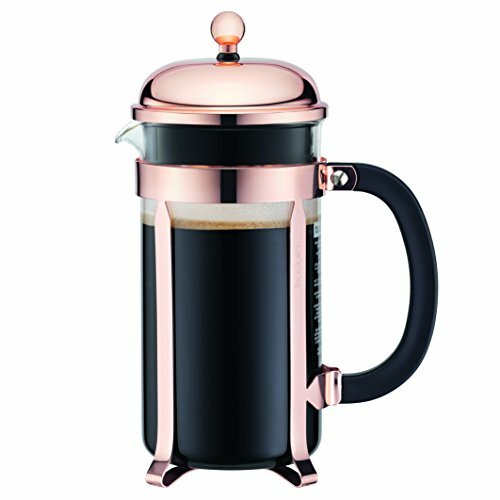 By spending a little less than our top pick, you can get this wonderful French press. While almost all areas of the coffee maker are impressive, we prefer the taste over everything. Within five minutes, you can have an awesome cup of coffee that doesn’t lose aroma. I personally take a few minutes extra so that the essence is left. 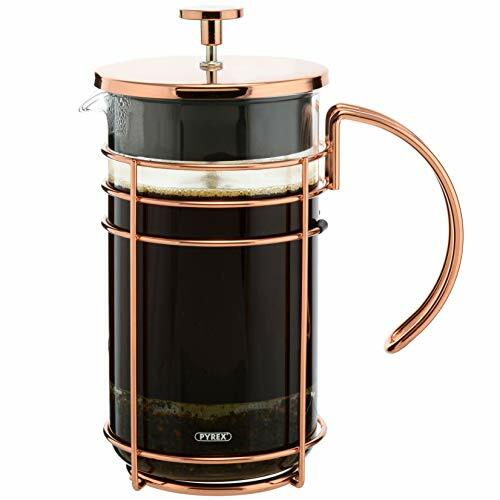 Like our top pick, Bodum Chambord French Press Coffee Maker has an amazing build quality as well, thanks to the metal housing and carafe made out of glass. Don’t expect it to last for years, though. It’s surely one of the best French coffee makers for most of the beginners out there. Bodum Chambord French Press Coffee Maker is the perfect choice for beginners. It’s a reasonably-priced product you can count on. Are you looking for something even affordable? Bodum Brazil French Press Coffee Maker is a potential choice in the market. I believe this product has traded some non-important areas for the important ones. To start, for instance, this French press coffee maker has one of the smoothest brewing processes — something that really matters. On the other hand, the housing is made of plastic — but, again, good plastic. The product not only feels so premium but also sustains heavy usage. Most importantly, the construction can handle an optimal amount of heat. The only area the product has made things a bit worse is the design. Don’t expect the art of coffee-making with Bodum Brazil French Press Coffee Maker. We’d recommend Bodum Brazil French Press Coffee Maker to every beginner French press lover in the scene. It packs so many features and many features inside. Here comes one of the premium picks in this list. GROSCHE Madrid Premium French Press Coffee Maker has been designed with usability and control in mind. If you’re someone who’s used to traditional French press makers, you may need some time. Even then, the learning curve is nothing compared to the ultimate taste of the coffee you drink. On top of everything, I loved the dual filtration system. It keeps the sediments aside while keeping the aroma and essence alive. We could have loved this product for the performance alone, but the design is great from a usability point of view. GROSCHE Madrid Premium French Press Coffee Maker comes with a carafe that is capable of containing heat. We’d recommend GROSCHE Madrid Premium French Press Coffee Maker to anyone who upgrades from a normal French press coffee maker to something premium. If you are willing to pay a bit further, you can get a full stainless-steel French press coffee maker. Interested? 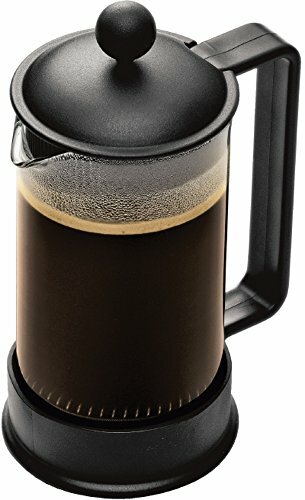 SterlingPro Double-Wall French Press is an awesome option out there. Designed for performance as well as usability in mind, you can count on this maker for the best coffee. Thanks to the double-wall design, it keeps your coffee intact as well. We would not recommend this product for ultimate beginners for obvious reasons. You must have a rhythm to the brewing process. Otherwise, there will be some bitterness to the coffee. If you know the art of brewing coffee, however, this is the best choice in town. We loved this product for its wonderful looks as well. Made of full stainless steel, it’s a great addition to your countertop or office desk. 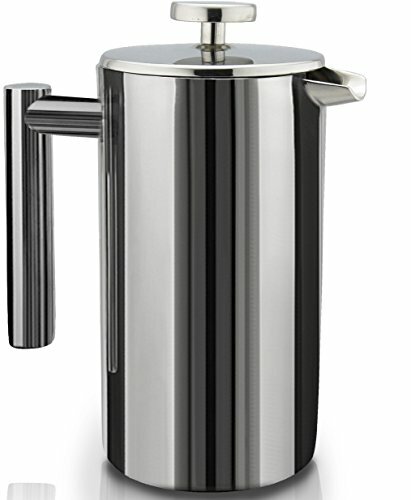 As said earlier, SterlingPro Double-Wall French Press is our outright recommendation for experts in the scene. If you know the art of brewing, it can help you all the way. You don’t have to be at home just because you need a cup of French press coffee. If you travel a lot but need a coffee to boost things up, Bodum Travel French Press Coffee Maker would be an ultimate companion. The best part is that you can drink your coffee from the same container. Because it’s travel-focused, the design is lightweight and easy to handle. If you know anything about coffee, you know that you can’t expect the same performance from a travel and non-travel coffee maker. Bodum Travel French Press Coffee Maker is no exception. While the brewing isn’t so bad, there are some downfalls indeed. Some users have also reported leakage when the product is placed horizontally. 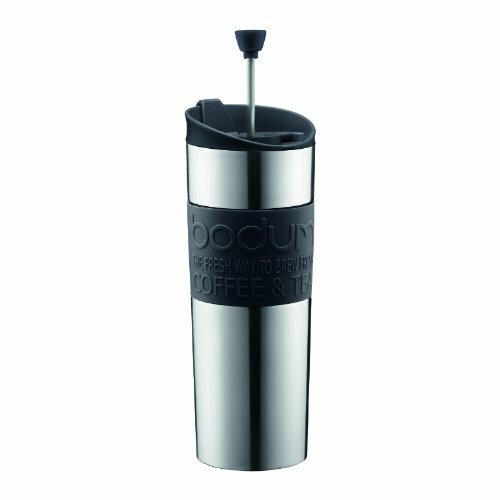 Bodum Travel French Press Coffee Maker is the perfect combination for every traveller if you ask. It brews some awesome coffee, brings the best features and still is portable. Are you ready to pay something extra for a better-designed travel French press coffee maker? Then, you’ve to give the KOHIPRESS Portable French Press Coffee Maker a shot. It comes with a reusable filter that makes the brewing process so simple. Just so you know, we are looking at a product that has been made for travel purposes. You cannot expect much of advanced performance/control here. By the way, what we love most in here is that you can use the same device for making cold brews as well. Once again, we cannot ignore how priceless it is to have an easily-cleansable French press coffee maker. In fact, every penny that you’re paying extra for this product is just worth it. KOHIPRESS Portable French Press Coffee Maker is the perfect choice for the common travellers out there. It compromises advanced control for portability though. Here you have one of the most premium and well-designed French press coffee makers in the market. It has to be noted that the price tag is a bit bigger. Nevertheless, Bodum Columbia Thermal French Press Coffee Maker offers one of the smoothest French press experiences ever. It literally amazed me that the dual-wall system can retain heat for up to 2 hours. 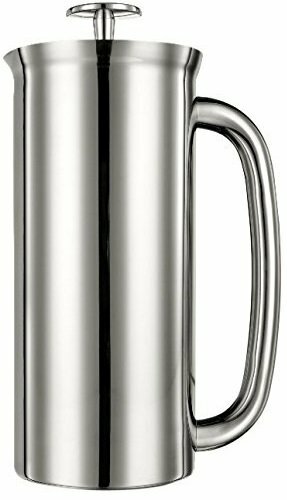 For someone like me, who wants hot coffee all the time, the Bodum Columbia Thermal French Press Coffee Maker would be an amazing choice. The best part here is that the exclusive design grants proper control over the brewing process as well. For one, it should have had a better filtration system. It’s very likely that you’d find some ground sediments in your coffee. On any day, we’d say Bodum Columbia Thermal French Press Coffee Maker is the best for premium French press coffee making. It always does the job so well. We’ve saved one of the best products for the last. You may have reached a stage when you want maximum control over the brewing process. Espro Press P7 Stainless Steel French Press is one of the best French press makers you can count on that. You’re paying more than $100 here, but the investment is worth it. You’ll be getting a complete French press system that lasts for years. It comes with dual filters so that you can’t find sediments in the final cup. 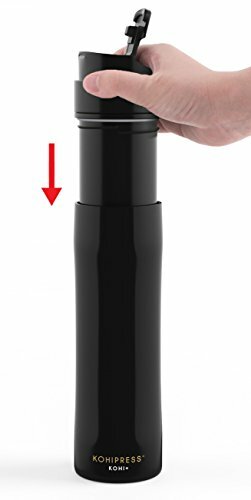 At the same time, the double-wall system in the package would keep your coffee hot/cold for a long period of time. While this is not the most portable device ever, you can count on Espro Press P7 Stainless Steel French Press for home baristas. It even comes with additional accessories that can help you in the long run. 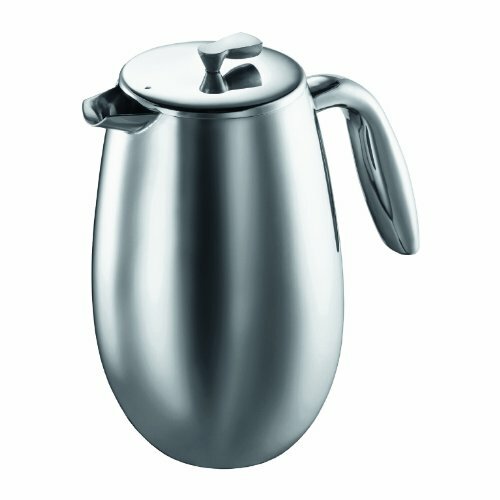 If you are ready to pay for quality, Espro Press P7 Stainless Steel French Press is the best deal in the market. It packs so many features and offers additional control. Now that you’ve seen some of the best French press coffee makers, we’ll have a Buying Guide. 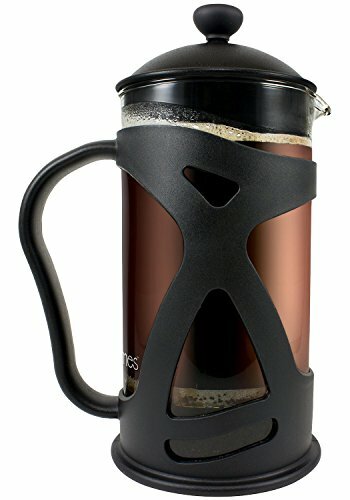 What Things to Consider Before Buying a French Press? As is always the case with coffee makers, you’ve to check a few things before picking a French coffee maker for your home/office. We’ll have a quick look at those. French press coffee makers come in all sizes and shapes. You have to choose one according to your need. To get an idea, make sure you get slimmer and portable. French press if you want to go somewhere. On the other hand, if you want the best control over the brewing process, we’d recommend sticking onto something sturdier and more well-built. The design matters a lot when it comes to the brewing process. You can find two major types of makers in the market: made out of glass and stainless steel. The advantage with glass-based coffee makers is that you can actually see how the brewing is taking place. On the other hand, if you need something so sturdy and lasts long, stainless steel would be the recommendation. Of course, not everyone can spend a lot on French press coffee makers, although we’d recommend that. It’s a great fact that you can find French press coffee makers at almost every price bracket. Still, even when you narrow down to a particular sector, you will have options based on price. Make sure that you choose a maker that suits your budget. So, this is how you basically choose the right French press coffee maker. Any of the choices above would help you, no doubt on that. But, the right coffee maker makes the best coffee, don’t forget that. Also, I recommend starting with a basic coffee maker if you’re just upgrading from the good-old drip coffee. We’ve reviewed some of the top-notch French press coffee makers so that you pick the right one, also covering a guide on how to use French a press.